Financial betting fanatics we have some bad news, the William Hill financials app isn't available on Android. However there are some great alternatives on Bill Hill, and a bigger selection for iOS users. Dedicated financial apps are hard to find, however large operators that offer financial markets can be easily accessed through your mobile browser. To access simply visit the operators website through your browser and login as usual. Android users do not despair, William Hill haven't totally forgotten you. There are currently two apps available on Android devices: the sports app and bingo. Neither are listed on the Android store, as Google forbids betting apps there, instead you need to access the William Hill website via… Google and download them directly from there. Both are free to download and can be accessed with your normal WH login. Sports fans rejoice, the application offers the full range of Bill Hill sports markets, right to your mobile. Unlike some mobile apps no markets are left out, giving you the full desktop experience. Live in-play markets and streaming: this extends beyond standard televised matches and features a huge range of games across numerous sports. Live scores: allowing users to follow the results of their favourite teams, even if they aren't betting on the outcome. Best odds guarantee on horse racing. Access to offers through the William Hill promo code. 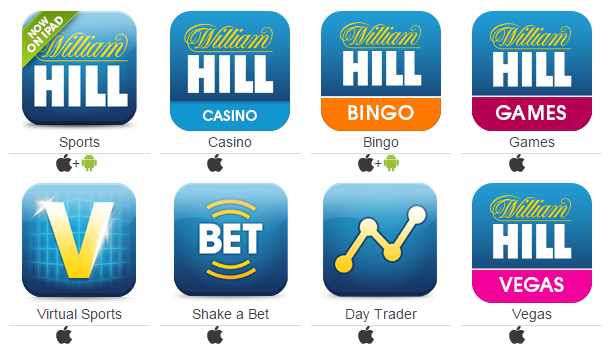 If you're a bingo addict and want to play your favourite games on the go then William Hill's dedicated app will keep you going. Themed games like Clover Rollover, Britain's Got Talent Superstar and Dynamite digger. The financial app Android users have been dreaming of is available for iOS, and is free to download from the Apple store. Financial betting could not be simpler and William Hill are one of the few major bookmakers to offer such service. Day trader allows punters to bet on the movement of commodities such as gold, silver and oil or to wager how currencies will fare against each other. Once you've made a wager the app allows you to instantly track markets in real-time. In total there are 132 different betting opportunities and betting types vary between traditional fixed odds and binary. To add insult to injury, not only do iPhone users have a financials app, but they also have 5 other exclusives on top of sports and bingo. Sports and bingo are the same as their Android cousins, while the other 5 each offer a range of specialist services and games to suit every betting need. Casino: exactly what you would expect, a range of casino classics, from roulette to baccarat and everything in between. Games: play games and win money, simple enough. With a variety of themes, gamers can enjoy a game of Monopoly or even a round of Lara Croft themed slots on their phone. Virtual Sports: with games starting every few minutes there are non-stop virtual sports to bet on. Shake A Bet: if you like risking money but want minimal say in the selection why not install Shake A Bet. The premise is, William Hill pick a bet for you based on a popular choice and you choose whether or not to accept it. Vegas: surprisingly the Vegas app has a lot in common with the Casino one, however it includes a lot more Las Vegas motifs, and potentially more Celine Dion and blue men. Note: as with the Android apps both are free to download, however these are available directly through the Apple store. For more information on William Hill's mobile platforms have a look at Betminded's detailed review.